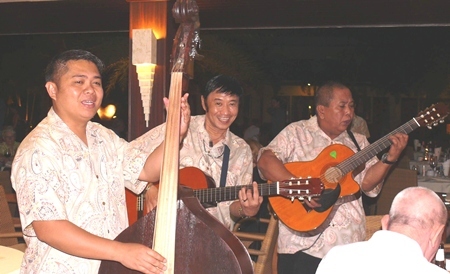 The Thai Garden Resort has been one of the most respected family style resorts in Pattaya for more than a decade. Its Moon River Pub outlet is well known for its atmosphere, entertainment and its food and drink, but the resort itself is probably not as well known for its buffets around the pool. That will change! For those who have never been to the Thai Garden Resort, it is on North Road, coming from Sukhumvit, 100 meters past Pattaya City Hall and on the other side of the road. You can’t miss it. The Thai Garden advertises its buffets as the “best value for money” buffet in town, so we decided to see if we agreed! The first choice was what night? This is because the buffets are every evening 6 p.m. until 9 p.m., but the theme changes each day. Mondays it is pizza and pasta, Tuesdays BBQ buffet, Wednesdays multi-cuisine buffet, Thursdays German buffet with roasted pig, Fridays Thai buffet, Saturdays international buffet and Sundays steaks and skewers buffet. We chose the Wednesday multi-cuisine buffet, and having two children with us, with multi-cuisines there would have to be something for even the pickiest of eaters. Parking in the Thai Garden Resort’s grounds is easy and secure, and you go in via the reception area, heading towards the free-form swimming pool. On your left is a glassed in air-conditioned area which has the food from the resort’s cold kitchen, and then in front are many tables, all with quality tablecloths and settings. 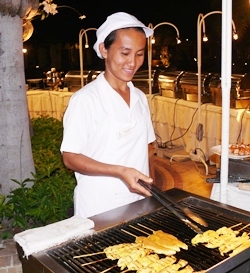 The hot food is around the pool, complete with a live cooking station producing satays. On the night we went along to do the review, there were no spare tables, and we were very glad we had booked. I suggest you do too, as the price of B. 299 (note: no add-ons) makes this one of the cheapest buffets in Pattaya. It is no wonder it is popular. 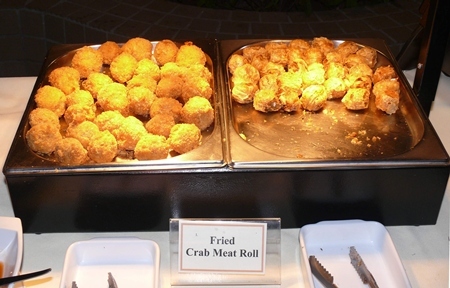 Like all buffets, order a glass of wine, relax a little, and then make a leisurely stroll around the food items. Two house wines are available – Chilean at B. 150 per glass or the premium (Lindeman’s – Australia) at B. 200. We tried both the premium white and the red and they were excellent. 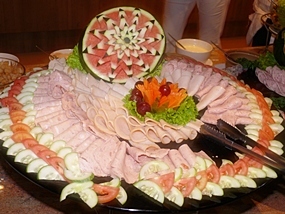 Back to the buffet, beginning with the cold/salad items, there were many interesting offerings, including an asparagus and cheese salad along with salmon and cold cuts including a peppered ham. Moving out from the air-conditioned area to around the pool, there was a long line of hot boxes and a soup tureen. My daughter was delighted that children were not forgotten and she selected a large helping of spaghetti and meat sauce, which she proudly brought to our table. The food items were well cooked and flavorsome. With it being a ‘full house’ the items were being constantly turned over, so were freshly cooked. For me, the chicken and potato curry took my fancy, along with some fried rice. However, I did help myself previously to the salmon and ham from the cold kitchen. Desserts were also plentiful and young son gave the chocolate balls the thumbs up. With the prices being B. 299 net for adults and B. 199 net for children under 12 and infants under four years of age free, this certainly does make the Thai Garden Resort buffets great value for money, and we have not experienced better value. More than just “better” value – “amazing” value is probably more to the mark. And the strolling musical trio playing requests just added to that value. We can certainly recommend the Thai Garden Buffets, but do suggest that you book. Value like this does attract a full house! And go soon, as these special buffets are only till February. The Happy Hour (and a half) runs from 5.30 p.m. until 7 p.m. too, and they ring a bell to let you know when happy hour finishes. Do go, you will not be disappointed. The Thai Garden Resort, North Pattaya Road (179/168 M5 – coming from Sukhumvit it is 100 meters past the Pattaya City Hall, on the other side of the road), telephone 038 370 614 or email [email protected] Secure parking within the resort grounds.